This book has been sitting on my craft shelf for a few years begging me to have a go at some of the beautiful things inside, but until I found out about the SIBOL (Sunshine International Blankets of Love) project I didn't really have any need to make anything from here. Fired up with all the lovely images of different granny squares over on SIBOL I dove into my stash and spent a good few hours to come up with these 4 different 6" squares. From the top left clockwise we have the Accent square, the Circle square, the Grannies-Lace square and lastly the 3-D Rose square. For some reason my accent square seems to be a bit squiffy - I'm going to have to try a bit of careful blocking on it to see if I can straighten it out. The other squares all seem to have turned out similar to the illustrations so I'm pretty pleased with them. These squares will be making their out to the project soon, possible with some extra squares as I've developed a bit of a taste for doing them now. 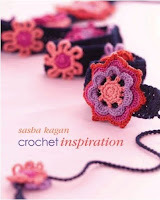 This is a beautifully laid out book with great colour photos of all the motifs and projects. It is divided into 5 main sections with stitch patterns for different crochet fabrics at the start, some beautiful crochet motifs, lots of different squares, some very beautiful flowers and a few projects at the back to give you some ideas about how you could use the patterns. This is a book that you could find yourself turning to for all sorts of things and I do find myself spending hours gazing at the photos to give me ideas and inspiration for the work that I do. This isn't a book that has been aimed at beginner crocheters, there are no diagrams/photos of how to work the basic stitches and all of the patterns have been written in a heavily abbreviated form which can make them difficult to follow. There are a good few errors in the patterns which should be easy to spot as each pattern also has a crochet diagram underneath. Even so this is a book that I would highly recommend a more experienced crocheter to own as it contains such a wealth of lovely crochet patterns. So pleased you are enjoying SIBOL. The squares are just beautiful! Yes I agree, there are so many beautiful squares on SIBOL. I've uploaded two lots today! Love your squares - such pretty colors you have chosen. I have had this book on my "wish list" for quite awhile. After reading your review, I know I must buy it. Thanks for this great review!! You helped me make my decision! !